His size, strength and skill are more than enough to rattle the most seasoned NHL player. And Rick Nash’s new teammates couldn’t be more grateful to have him on their side. Offensive prowess. Excellent puck-control play. Solid two-way skills. 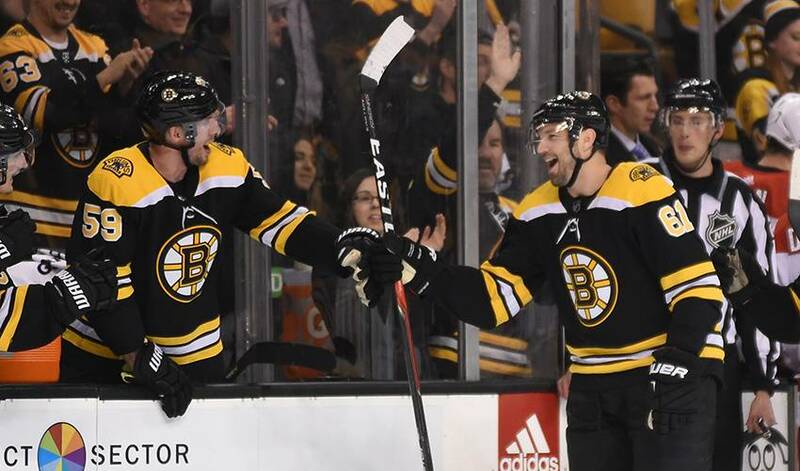 Boston players knew just what to expect from the 6-foot-4, 210-pound left wing whenever the Bruins faced off against the New York Rangers. So when the 33-year-old Nash was dealt to Boston from the Blueshirts February 25 for forwards Ryan Spooner and Matt Beleskey, defenceman Ryan Lindgren, Boston's first-round pick in the 2018 NHL Entry Draft and its seventh-round pick in 2018 – his new teammates understood precisely what their new teammate would bring to the table. In his 15th NHL season, Nash skated in 60 games with New York, scoring 18 goals and adding 10 assists for 28 points. He’s spent the past six campaigns with the Rangers, including a 2014-15 season that produced a career-best 42 goals. The Brampton, Ontario native came to New York in a 2012 trade after spending nine seasons with the Columbus Blue Jackets, and went on to achieve a huge career milestone with the Rangers by skating in his 1,000th NHL game earlier this season. Selected by Columbus in the first round (1st overall) of the 2002 NHL Entry Draft, Nash is the Blue Jackets all-time leader in games played (674), goals (289), assists (258) and points (547). For a trip down memory lane, check out the NHLPA.com's throwback to an old favourite, as a young who has Nash yet to hit the franchise records he did with the Blue Jackets, in his Be A Player: Rewind episode, originally aired in 2004. In 2003-04, he won the Maurice Richard Trophy (sharing the honour with Jarome Iginla and Ilya Kovalchuk) after topping the league with 41 goals. He’s a six-time NHL All-Star (2003-04, 2006-07, 2007-08, 2008-09, 2010-11, 2014-15) and a two-time Olympic gold medalist with Team Canada (2010, 2014). And as Boston players quickly discovered during morning practices, he’s not easy to go one-on-one against. “He’s such a strong guy on his skates,” offered Riley Nash. But not a player interested in seeking the spotlight. That was evident when Nash, who has appeared in 77 career postseason games, recording 15 goals and 26 assists for 41 points, spoke with the media on the day of his trade. Just not for those tasked with shutting Rick Nash down.